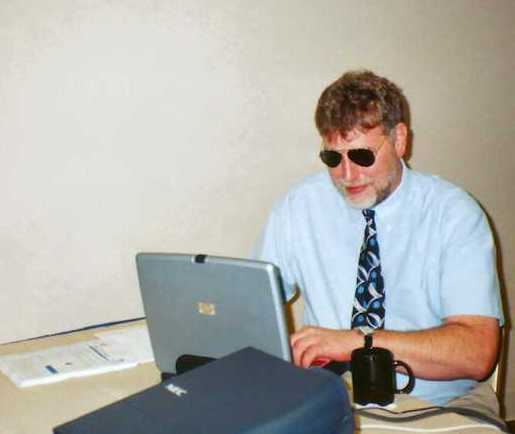 A photo from the '90s of Larry Skutchan working on a laptop. When I lost my sight in my early 20’s, I didn’t appreciate the value of braille. I knew it would be a good thing to know, but I had no idea how important it is to enriching life. Of course, training fingers to distinguish the patterns was tough, but Arkansas Enterprises for the Blind (now Lions World Services) in Little Rock had incredibly talented and patient teachers and they made remembering the patterns easy even if distinguishing them took nothing but lots of practice to master. This all took place in the early ’80s, so personal computers were just coming into their own as useful tools. I thought like so many others did, that synthesized speech would be enough for me to finish college and work myself into a meaningful career in law. As things so often go, what I thought would happen turned out to be so far from the route actually taken that it was not even recognizable. Instead of studying the law, I ended up loving the computer as a tool and focused on that continuing to think braille was not so important. As any braille reader will tell you, there is a huge difference between listening to something and actually reading it. There are numerous studies emphasizing the value of reading skills and how different they are from audio absorption. No parent would allow their sighted child to accept audio over reading in an educational setting, and neither should any parent of a blind child. What is not so apparent, however, about braille is the value in the note taking area. 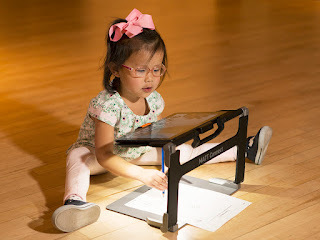 Today’s less expensive refreshable braille displays, like Orbit Reader and Braille Trail, make it feasible for nearly any student or professional to afford a tool that serves as both pencil and paper, and there is no comparison of the benefits of writing over recording for note taking. Writing in braille is as close to using a pencil and paper as a blind person can get for now, and it is also equivalent and efficient like using tablets to take notes. A photo from the '90s of Larry giving a presentation. 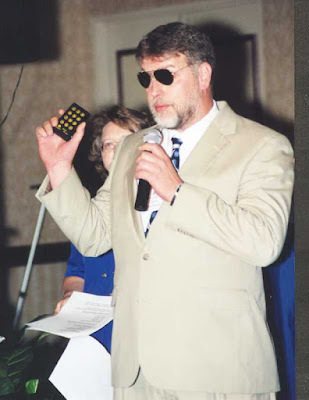 Other innovative uses of braille, like VoiceOver’s braille screen input make texting and note taking as efficient for the blind as they are for sighted users. With this feature, the user can position their hands on the touch screen in the pattern of a braille keyboard and type nearly as quickly as anyone can on a phone screen. One of the most obvious and useful aspects of braille is its potential for labeling nearly anything. It is particularly useful for labeling important papers. Of course, there are other ways to label objects including bar codes, recordings, running optical character recognition and more, but it has been my experience that of any labeling method ever used, braille is the most reliable. I have papers I labeled 40 years ago, and the braille has not changed or gone obsolete. I can count, on the other hand, a dozen alternative approaches to labeling that are no longer available. Some countries even mandate braille labels on some consumer goods, especially in the pharmaceutical area. There is no doubt that a simple braille label on packaged goods would go a long way toward making the life of a blind person much simpler in the kitchen and elsewhere in the house. In short, braille is a blind person’s best way of reading and writing, and there seems to be little on the horizon that will change this.